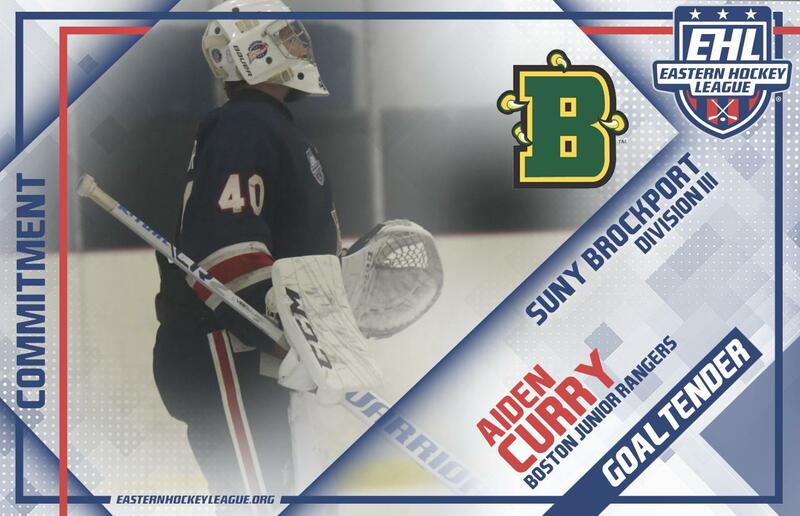 TEWKSBURY, MA -- The Boston Jr. Rangers are pleased to announce that Aiden Curry has committed to SUNY Brockport for the fall of 2019. Curry is in his first season in the EHL and with the Rangers, and he owns a record of 8-2-0 through his first 10 starts. "We are very happy for Aiden on his commitment to Brockport,” said EHL head coach and general manager Rich DeCaprio, “Aiden has been great for us, and earning a spot on the league's All-Star Team proves that. He works really hard both on and off the ice, and he will have a great NCAA career." As DeCaprio mentioned, Curry's performance so far this season earned the native of Michigan a spot on the EHL All-Star Team. When you combine that experience with all exposure that Curry has received to date, the '98 netminder is very grateful for his time with the Rangers. "I've enjoyed my time here with the Rangers, ever since joining the team in September," said Curry. "Coach DeCaprio pushes us to get better every day, and without him and the rest of the coaching staff, I would not be where I am today. I am excited to be joining SUNY Brockport in the fall of 2019. I really enjoyed my visit there, as it truly felt like the best fit for me. I would like to thank Coach DeCaprio for helping me reach my goal of playing college hockey. I would like to thank my teammates, as without them, none of this would have been possible. I would also like to thank my family for all of their support over the years. I am very excited about my future at SUNY Brockport." Looking ahead, the Rangers have 2 showcase games left before the team departs for the holiday break. Curry and the Rangers will take on the Philadelphia Jr. Flyers tomorrow at 5:10pm, and then the Philadelphia Revolution at 8:20am on Friday.